It’s September 8th and you know what that means: it’s exactly one month to the day before the start of the 2015 New York Comic Con! It’s also six days and some odd hours before extended ticket mailing for the show closes. 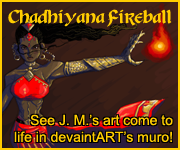 As in the previous few years, I be exhibiting in the small press area (I believe at the same booth as last year: 1259)–so be sure not to look for me in artist alley. That said, though I’ll be in the same spot as some small publishers, it’s not only books you can get at my booth (though, you can get books too). Though I won’t be in artist alley, I’ll be offering convention sketches all weekend long (on a first come, first serve basis). 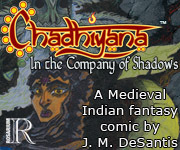 I’ll also have my growing selection of art prints on sale as well as free bookmarks (including an all new one, for those who’ve enjoyed the old ones) and copies of both Chadhiyana #0 and Chadhiyana #1. What’s more, I’ll be promoting my new monthly e-newsletter and, likely, my new web-comic, Gentleman Cthulhu (gentlemancthulhu.com). So if you’re planning to attend the show, mark me down in your show planner on the New York Comic Con website (newyorkcomiccon.com), especially if you’re looking for something different from the mainstream comics. Or maybe you’re just interested in visiting an artist’s table, but don’t want to have to make the long walk down to artist alley. Whatever your reason, I hope to see you at the show. Cheers! For more information about the upcoming New York Comic Con, visit newyorkcomiccon.com.